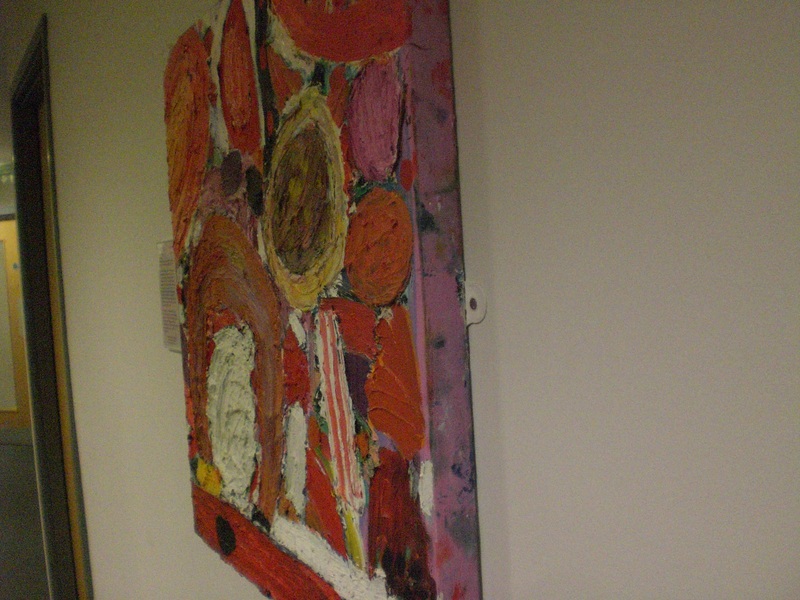 The Mathematics Institute at the University of Warwick has a number of abstract paintings on the walls. One of them is painted directly onto the wall. 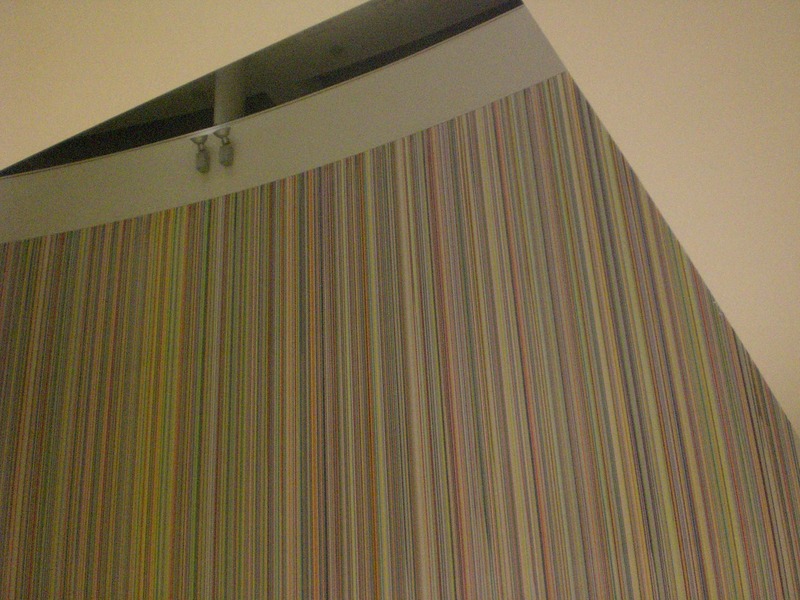 This magnificent work by Ian Davenport entitled Everything, is the result of pouring paint (via a syringe) from the top of the wall, one stripe at a time. 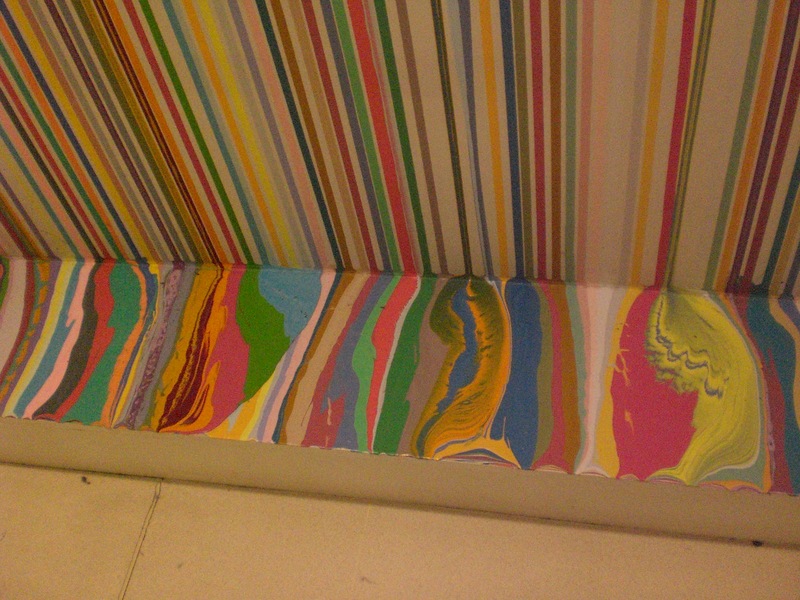 The colours run down the wall and form little pools on the ledge below. Following a predetermined system Davenport seems to combine both control and chance, the colours taking the path set for them, yet sometimes meeting and mixing with others, their specific forms allowed rather than delineated. 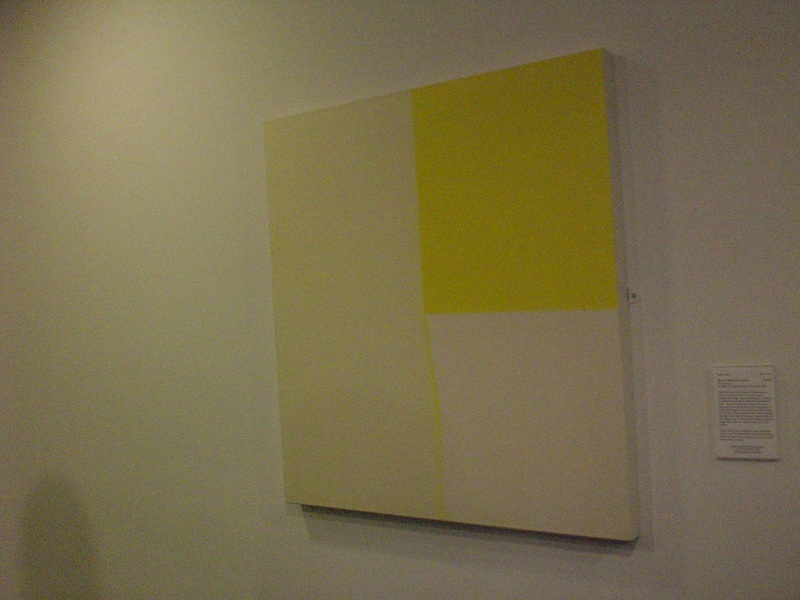 There are smaller paintings than this, some of theme equally concerned with the process of painting, and with the “deliberately accidental”, Callum Innes‘s words for the process he adopts of dividing the canvas into two, painting a quarter with a flat colour leaving the other quarter exposed, and then taking the same colour and applying it to the other half of the canvas before “unpainting” it by rubbing it off with turpentine, leaving a ghost of the original colour. Down the corridor from this painting is almost its opposite. A painting that has little interest in ghosts of paint, or even in paint that is flatly applied. 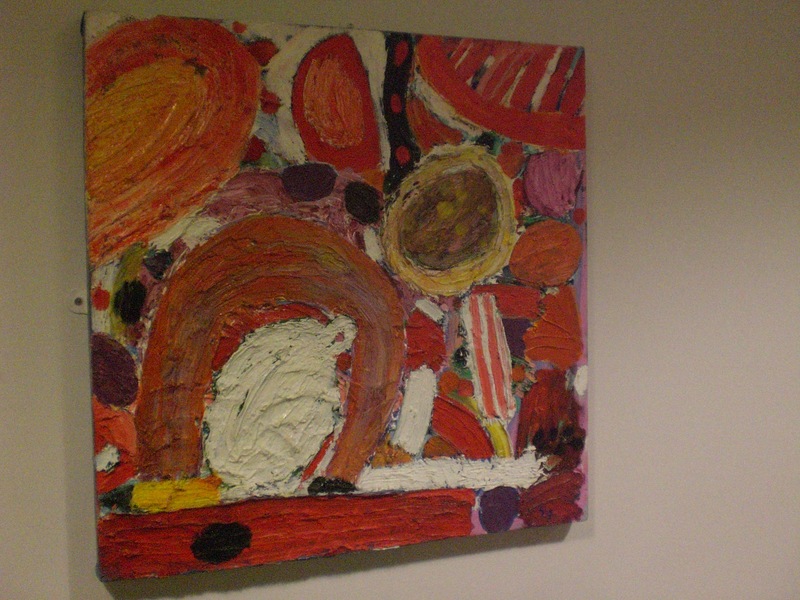 Gillian Ayres‘ paint stands a couple of inches off the surface of the canvas, thick and physically present. I have written from time to time about art in the workplace, keen as I have become, to see good paintings there, pleased on the odd occasion that I find some, and fascinated by the responses of workers. Why I haven’t thought before about art on display in those particular workplaces called universities I don’t know, especially as there are often galleries associated with them, and also that the buildings are sometimes open to the public. 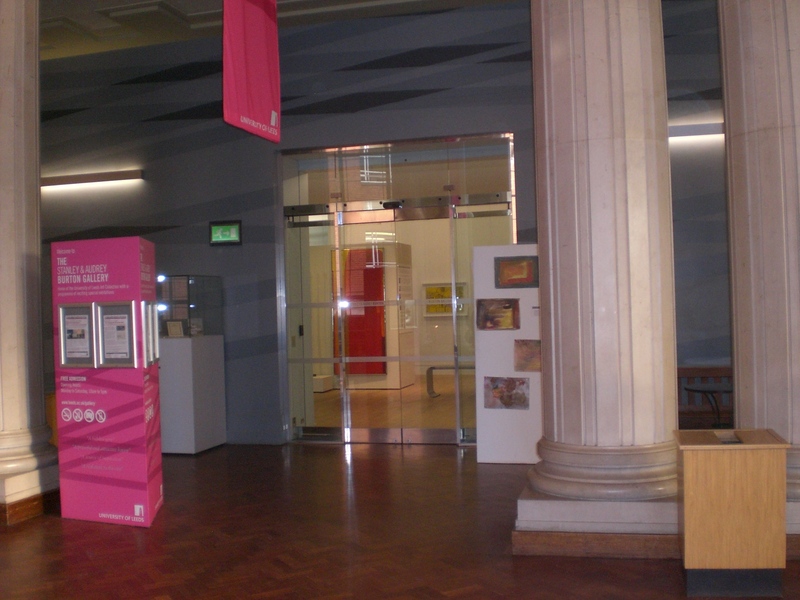 In Nottingham the Lakeside Gallery is part of the University of Nottingham and The Bonington Gallery is in the School of Art & Design at Nottingham Trent University. It is not so long since I visited the Whitworth, at Manchester University and the other day I was introduced to the Stanley and Audrey Burton Gallery in the Parkinson Building of Leeds University. They have some lovely abstract paintings, including work by John Hoyland, Terry Frost (one that I think is particularly good), Victor Vaserely, Victor Pasmore and Trevor Bell. I have many times been on the campus of Warwick University but never realised that there was art to be seen there, not only at the Mead Gallery, but also on the walls in the University buildings. Click here for an excellent introductory online exhibition.